These chairs are the perfect addition to my home! I purchased 2 as part of a conversation set to go with a table also purchased from overstock and absolutely love it! The chairs are a nice size and very comfy! Fusing classic appeal with a hint of contemporary charm, the designers of the Costanza chair. 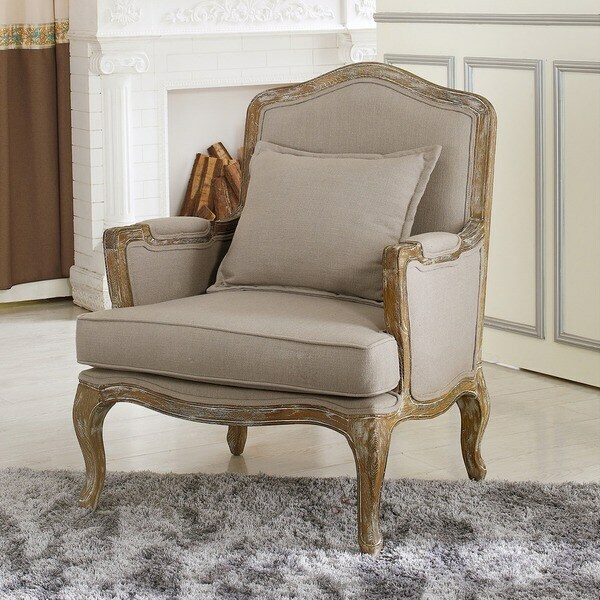 It is a French accent chair with a distressed, antique finish and a soothing greyish taupe upholstery - had a sunlit afternoon of relaxation and leisure in mind. With a ultra-comfy foam fill, aged white streaking across its wooden hardware, and a sturdy rubberwood frame, this chair is a winsome addition to any stylish space. I purchased this chair to replace our "manly" chair which is need of reupholstering. I had purchased chairs of similar style from a high-end furniture store so I was somewhat hesitant to make this purchase. The fact that the price at Overstock.com was many times less than the cost of the chairs I already own was the deciding factor. When the package arrived the box looked a bit worse for wear but on unpacking the chair I found it to be in perfect condition. I'm not terribly good at visualizing size so this chair is slightly smaller than the chairs I have; this proved to be an advantage in the location where it is placed. The size is more than ample for an adult to sit in: it's just not bulky. The look of the chair is stunning. The color exactly matched the color on my monitor. The fabric is a bit coarse, but this is an advantage for a chair that is in constant use. The chair cushion is quite firm, which we prefer, it will probably soften over time. I love this chair and would not hesitate to purchase it again. Thank you. Overstock.com! I bought 2 of these. They are not without faults but I decided to keep them as they are nice looking and the price was right. They are true to pictures on sight and as described. The wood is slightly rough as many commented but that is the look I was going for. One chair did have a chipped and splintered piece in the back and one leg is slightly shorter than the rest. I fixed this by putting a chair pad on the leg. I agree with the others who said the pillow is not great looking and the cushions does not fit properly. There is an inch or more of space between it and the arm frame. The seat cushion is firm so if you like a firm seat I would say you would find it a comfortable chair with plenty of seat space. I will close with saying "You get what you pay for". If you are looking for a perfect chair I suggest you pass on this one. After having this chair for a week, I thought it might be okay to write this. I sat in after I got it out of the box, and I thought it was a little on the firm side. Some people like that in the chair and not have to climb out of it from being too soft. Maybe that will change over time, but for right now I'm listing it on the firm side. It looks big in the listing page, and it is big. I'm 6'2" and it's big on me. The seat portion would be big enough to seat two small kids. As in the seat is 22 inches near the backrest, and 24 out front. It's not all that heavy, in order to move it around, but does take up space in that it's just big. It does seem well built, and I have sen any loose pieces or fabric hanging from it. It comes with a pillow and I think that will help. Not for just myself but for your quests. The page color is actually right on. So for right now, time will tell. I didn't rate it all that good, and for now I am not recommending it, because I probably wouldn't buy another one, based on what it's like now. I might not have bought it if I was sitting in it at a store. Very elegant, just as pictured. We use this chair as an accent chair in a guest bedroom. Sturdy and easy to spot clean. Overall, this is a very nice product. I like the wood finish. I wish there were more color choices for the fabric, if not other fabric choices. The other thing is the seat cushion: it looks like it's made out of foam and I don't think it should, not for this kind of product. It makes it look cheap. If I were the manufacturer I'd be looking closer at the shape of this cushion. I've read reviews saying that the seat is firm or very firm. Well, I'm sure that when this kind of chairs were made with springs the seat was very firm at the beginning. Excellent service at Overstock. I ordered two of these chairs for my living room. The legs and arms look very distressed liked the picture and the fabric is a neutral beige/gray. I am really pleased with them, exactly what I've been looking for. Great purchase. They arrived assembled and quickly! I'm overwhelmed with happiness about these chairs (I bought 2). Very similar to the picture on the website. The style, color, fabric, material...everything is just beautiful. I literally cannot express how happy I am with my purchase. Gorgeous, gorgeous. If you find this chair appealing...do not hesitate to buy. Grand chairs. Love the arm, the white washed wood, the upholstery is well done. Looks like a $$$$ dollar pair of chairs. Great chair. Great quality. True to color. Pillow looks a little cheap but I bought it knowing I wanted to replace it. 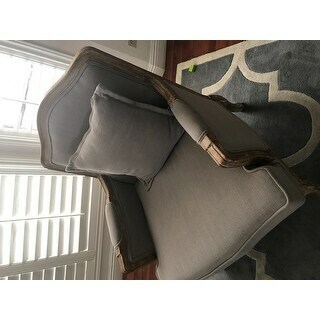 From reading other reviews I knew it would not be the most comfortable chair which was fine with me because its an accent chair, not a chair that I will be sitting in often. Very happy with my purchase. Beautiful chair! Looks exactly as seen on the website. Not very comfortable, but it looks great! All information including the box said the color was beige, after opening the box the color of the chair was grey. The wood on the arms is rough. Not happy with the wood on the arms. Chairs are beautiful, very well constructed, but was disappointed with height. Way too low for average adult to get in and out of. Almost ridiculous. Love the chairs, but will have to have them elevated. I had them for a while and they are surviving my toddler great purchase. They are good size and heavy to my surprise they look and feel more expensive. The gray color is true gray. We loved this chair so much we purchased it twice. However, I highly recommend you to buy your multiples at the same time. The one we ordered first has a lighter stain. It's noticeable but doesn't bother us. The chairs are very comfortable for plus size people. We've use accent pillows in them for added decor. We've had these chairs for at least 3 years. The quality is very nice. No problems so far. Love this chair! It's exactly as pictured and perfect for my office! Nicely styled chair. The box was beaten to death, but the packing inside protected the chair from damage. Fabric is grey, but still nice complement to wood accents. I love these chairs, large, stylish and comfortable. I had to leave them in Ca, wish I had them with me in Hawaii! Gorgeous chairs!!! Absolutely excellent quality and worth the purchase. This has to be one of the best buys ever! I purchased two of these chairs and get so many compliments on them! They look expensive and fit beautifully in my room! This chair arrived well packaged and was as described. It is of great quality and true to the color in th photo. It is comfortable to sit on. "I'd like to use at the end of a large dining room table. How far from the floor to the top of the armrest? Thanks!" I measured from floor to padding on armrest (highest point) and it is a little under 2 feet. The width of the arms in the front of the chair is 28". It's a lovely chair and comfortable. "This fabric appears to be sort of a French Blue (between soft blue and grey) but some reviews said it was more beige. Any thoughts?" Hello gogirl51, this item features a neutral beige-gray finish. Thank you for shopping with us. "What are the dimensions of the pillow that comes with the chair?" Hello elk312, the pillow is approximately 17.71 inches high x 17.71 inches wide. Thanks for shopping with us! "Is there an ottoman to match this chair?" Hello Koshernostra, unfortunately this item is out of stock. We currently do not have inventory to check, and cannot guarantee the item will be restocked. Thank you for shopping with us. "Where is this chair made?" Hello starpointe, this is made in China. Have a great day! "do they offer any setts/love seat in this style?" Hello momdecoratingnewhouse, We do have a number of settees in our inventory, but I did not find a match to this chair. Thank you for checking with us. chair. It is a French accent chair with a distressed, antique finish and a soothing greyish taupe upholstery - had a sunlit afternoon of relaxation and leisure in mind. With a ultra-comfy foam fill, aged white streaking across its wooden hardware, and a sturdy rubberwood frame, this chair is a winsome addition to any stylish space.